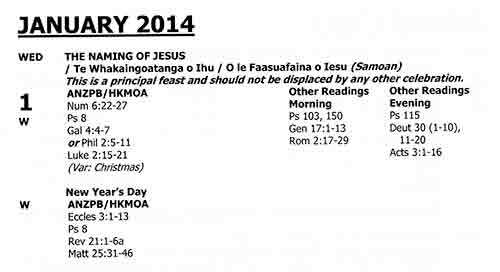 Many of us have, by now, bought our copy of the booklet The Lectionary Te Maramataka 2014. Our lectionary booklet helpfully indicates which feast to celebrate. On January 1, for example, it tells us THE NAMING OF JESUS is a principal feast and should not be displaced by any other celebration. Below which it places another celebration – presumable just for information as the booklet has just said it may not be celebrated?! Our lectionary booklet also helpfully gives titles to Sundays, numbering them in a way that ordinary people could never understand enough to work out for themselves. Eg. Sunday January 26 is “3rd Sunday of the Epiphany”; the next Sunday, February 2, is “The Presentation of Jesus in the Temple”; and the following Sunday, February 9, is “5th Sunday in Ordinary Time” – the first Sunday in Ordinary time to be mentioned, without any explanation of what happened to the “1st-4th” Sundays in Ordinary Time. Our lectionary booklet helpfully provides the readings we have agreed to use. 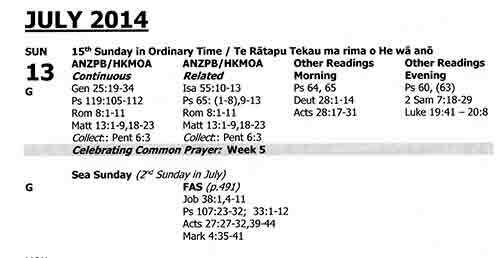 These have been agreed to by following the “Twice Round” process (General Synod Te Hinota Whanui; Diocesan Synods & Hui Amorangi; General Synod Te Hinota Whanui again) and are called “formularies”. And are binding on us to use. Above is an example of ignoring this agreement. “CW” indicates mummy Church of England’s Common Worship, which has no status in our church, and the readings provided in the lectionary obviously are not to be used to replace our agreed formulary readings of 1 Sam 16:1-13 etc. 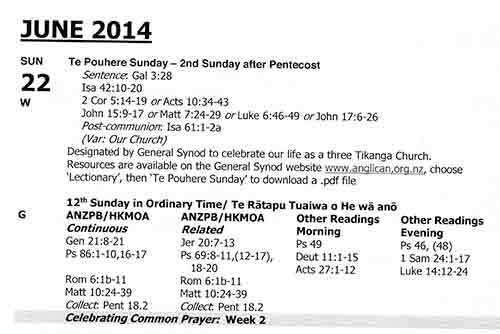 Te Pouhere Sunday may be celebrated in the manner of “Refugee Sunday” or “AAW Sunday” etc. (or even in the manner of the readingless “Feast of Christ in All Creation” mentioned above) but we have not used the “Twice Round” process for the readings provided in this booklet. So you may remember Te Pouhere in the singing, preaching, and praying, but the readings we have agreed to for this day are Matt 10:24-39 etc., not what is provided in this booklet at the top of its page. Just like Te Pouhere Sunday, this time you may sing “For those in peril on the Sea”, pray, and preach for “Sea Sunday”, but you may not use FAS (“For all the Saints”) readings, provided in this booklet, to replace our agreed readings of Matt 13:1-9, 18-23 etc. Now that I’ve got you started, enjoy the game of finding further examples in this lectionary publication brought to you by the Anglican Church of Or. 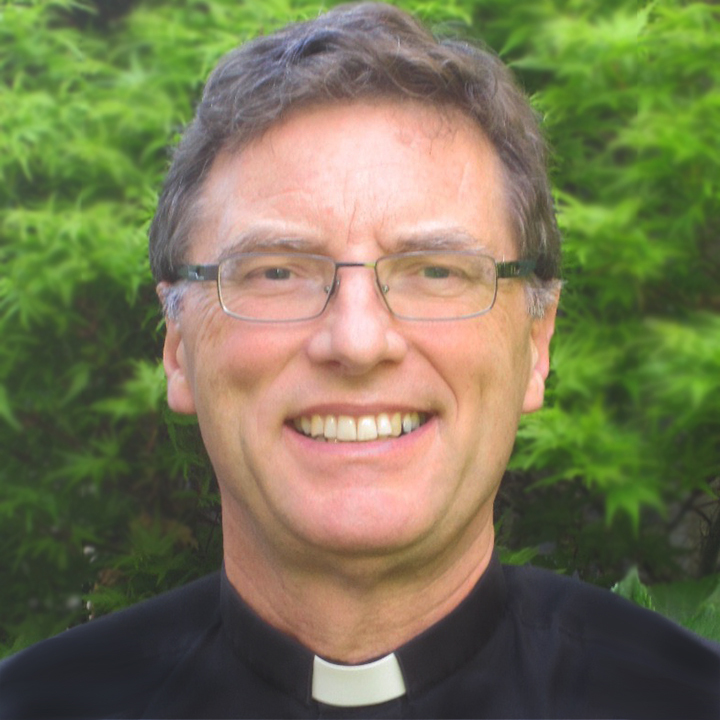 More on the Anglican Church of Or’s liturgical confusion. Updated: Rev. Brian Dawson points out that last year’s “2nd Sunday after the Epiphany” has, this year (without explanation), become “2nd Sunday OF the Epiphany” [God forbid that we have two years in a row without a change!] The suggestion that this is “more nods to mother England” is true in part. The CofE has “The Second Sunday of Epiphany” (no “the”). It must be great to play around with this stuff in the dark winter of the CofE at that time (with everyone looking for more stuff to make the winter more interesting), but here, down under, in the full summer, when New Zealand shuts down for the month of January, it’s the time of year when few even come to church in NZ. Or should I say fewer? ← Pope Francis’ 39 Articles? Are you being unfair to both the authors/compilers of the lectionary and to the ordinary parish clergy and people of our church? Further, are you overlooking possibilities for two celebrations on the same day? Unfairness: whether we like it or not, and whether we have agreed to it or not, people in our church like things which we may not yet have caught up with canonically. Take ‘Remembrance Sunday’. There are priests and people who like Remembrance Sunday to be celebrated (as I was reminded myself, yesterday, having forgotten about it)! The lectionary helpfully provides readings for Remembrance Sunday for those who wish to celebrate it as a desired celebration of the local parish community. Example 1: it is possible that a priest could offer on or about 11 November at a parish service the ‘required’ readings in the usual and canonical way, before proceeding to take a rest home service full of military veterans where it would be pastorally appropriate to acknowledge Remembrance Sunday with the helpfully provided readings. Example 2: some parishes ‘observe’ New Year’s Day with a ‘midnight’ communion to ‘see in’ the New Year: for that celebration readings are helpfully provided. The morning of New Year’s Day there could be a feast day service for the Naming of Jesus, in accordance with our ‘agreed’ practice! There are criticisms to be made of the lectionary but I am far from convinced that some of the criticisms of the lectionary you offer above would find common reception across our parishes. 1) “Not yet canonically caught up with celebrating Remembrance Sunday”: Are you suggesting that Remembrance Sunday is a new celebration? For 2014? I’ve just checked back to 1988. Remembrance Sunday has been mentioned at least for those 25 years – how many meetings of General Synod and our Liturgical Commission did you say there have been in that time? If your priest in your suggestion cannot make connections between the agreed readings (eg. 1 Thessalonians 4:13-18) and the military veterans in the rest home service, I am concerned about their formation. According to your interpretation, is a priest required to follow the 32nd Ordinary Sunday readings at the primary service in a parish, but might use our (not agreed) Remembrance Sunday readings at a second (or secondary) service? That sounds good pastoral practice to me. Where is the information supporting your suggestion? Where is the passing of these readings as those for that second/secondary service? Where is the clarity that Ordinary 32 must be used at the parish’s main service? Some people become very concerned when certain formularies are ignored (read disobeyed) for the sake of pastoral reasons. Noting that those pastoral reasons are strong for some and weak for others, who determines what edges are the appropriate ones? 2) I think that you may have missed the tone of some of my post. However, continuing then to take your issue about New Year’s Eve seriously: firstly, see the comments above about a secondary service; secondly, see the comments above about being able to use our agreed readings in a New Year’s Eve service; and thirdly, can you give me the page number please where I can find the “New Year’s Day” readings that the lectionary booklet states it has drawn from our Prayer Book. Finally: a lot of what I write does not “find common reception across our parishes”. What a mess! It’s odd to see so many references to Church of England liturgical books. The only reason a province would do such a thing would be if they hadn’t adequate resources themselves. It’s interesting to look at what other churches are doing; it’s a completely different thing to muddle another church’s liturgical practices so unquestioningly into another’s. Seeing this fills with greater appreciation for your horror at the thought another province’s liturgical texts could be normative elsewhere. For the regular Sunday Eucharist the only words we have agreed to require in our province are those of the Eucharistic Prayer. For that we may use any Eucharistic Prayer authorised anywhere in the Anglican Communion. Everything else in the Eucharist we can compose ourselves, or source wherever we wish. At such a Eucharist a gospel reading is required. And my understanding is that this be from the church’s agreed lectionaries (BCP1662, 2 Year Cycle in NZPB, 3 Year Cycle in NZPB, or RCL). I think that is more than enough flexibility. Our lectionary booklet apparently does not; and provides further flexibility even beyond what I describe in the Anglican Church of Or. You are entirely correct to point out where the NZL 2014 is incorrect (e.g. 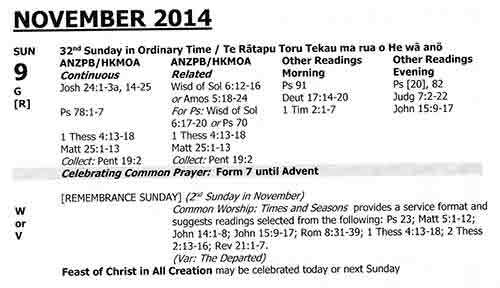 pointing to New Year’s Day readings when (as far as I can see) none are provided for in NZPB – though collects are. Further, it is wrong of the lectionary to provide CW readings for Mothering Sunday when readings are already provided for in NZPB, p. 690. I also accept your point that NZL (any year) could include in its rubrics distinctions between ‘primary’ services and ‘secondary’ services. However, rather than detail further argumentation, on reflection, there is a large issue at stake here, as you have previously and often discussed. What is ‘required’ by our church (etc), why will the bishops not supervise that more rigorously, and how come the lectionary does not accede more ground to what we have agreed? The issue for me in putting up a post like this, with its rather teasing tone, is that it might encourage those who want to abstain from our common prayer to have yet another reason to do so. I don’t want to be smug about this, because I’m sure that many people in Canada do exactly what they like. But I am feeling good about our church’s decision to print the RCL as part of our Book of Alternative Services. It really cuts down on the scope for yearly ‘enhancements’ like this to sneak under the radar screen. From my perspective, Tim, the BAS gets things often about right. Blessings.